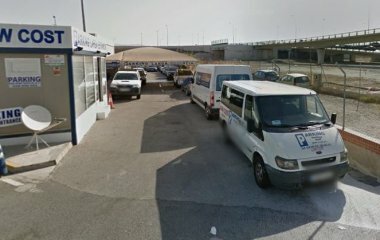 Buch einen Parkplatz im Pedrocar - Cubierto - Aeropuerto de Málaga Parkplatz. Indoor car park, close to Málaga-Costa del Sol airport, for short, medium and long stays. Leave the car in the parking lot; in no more than 5 minutes we'll take you to the airport terminal. Maximum security. It admits all types of vehicles (Motorcycles, cars, 4x4, vans, ... ). Buche die besten Parkplätze in Flughafen Malaga - Costa del Sol. You don't need to go the airport; we'll take you to the boarding terminal. When you come back, once retrieved your baggage, please call us and then go to the terminal's meeting point, we'll be waiting for you. 5 Sterne basierend auf 2 Bewertungen.